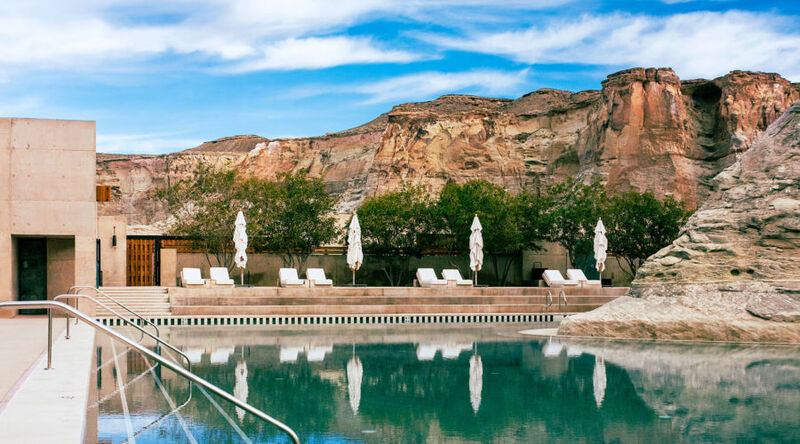 Whether you’re standing on the private deck of your secluded suite, basking in the heated waters of the cliffside infinity pool, or sitting in the spectacular Sierra Mar restaurant with its floor-to-ceiling windows, all the panoramas from Post Ranch are epic. The luxury resort literally hovers 1,200 feet up along the edge of the Pacific Ocean, but it’s not just the setting that’s unforgettable. The 40 uniquely designed rooms range from treehouses on stilts to modern suites that appear to be floating over the ocean. Bonus: The no-pay mini bar is perpetually stocked with gourmet snacks and bevvies. Don’t miss: Borrowing a Lexus and cruising the ever-scenic Highway 1. 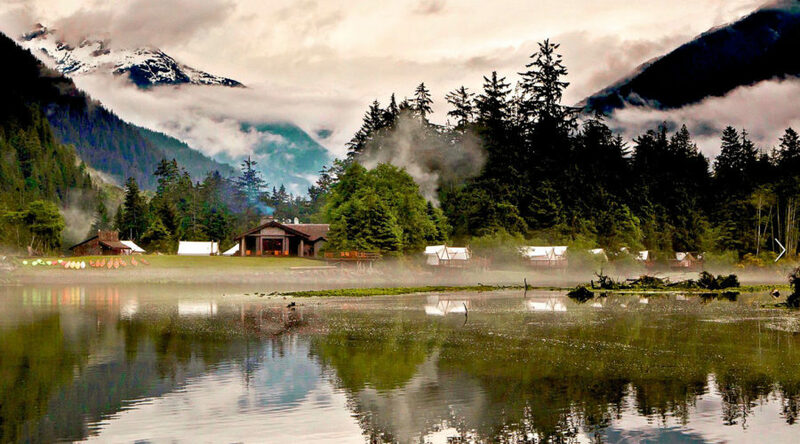 Part glampsite, part nature reserve, part wilderness retreat, this luxury tented resort in remote British Columbia occupies a slice of land where lowland rainforests and rivers collide with mountains and beaches to make all your adventure dreams come true. Heli-picnic on an alpine lake, ocean kayak to a deserted beach, see black bears and whales via Zodiac. 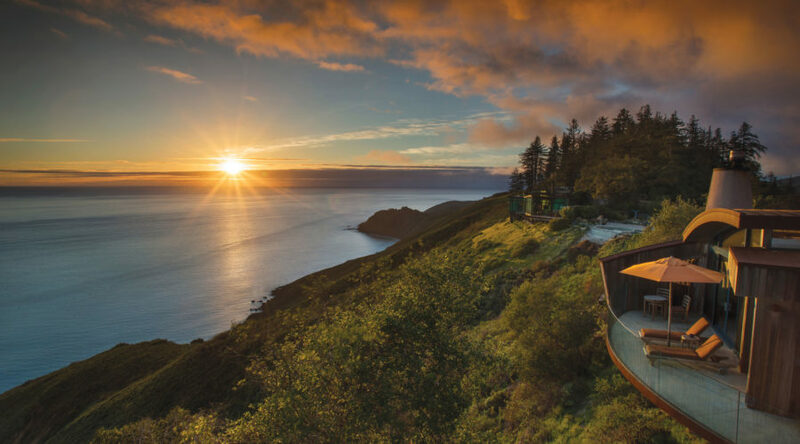 All that adrenaline pays off when you know you’re returning to luxury—as in waterfront massages, cedar hot tubs for soaking, and private platform tents opulently outfitted with king-size beds, Persian rugs, and heated floors. Don’t miss: Sipping a scotch or reserve wine in the beautiful glass waterfront lounge bar. 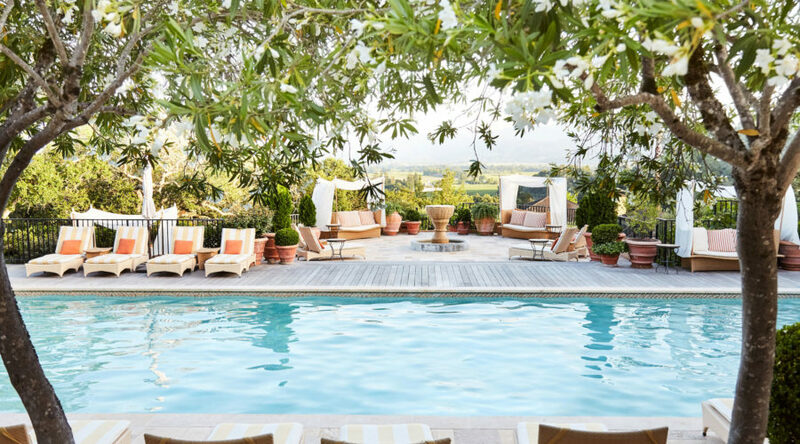 The thing about Auberge du Soleil, a property that put Napa on the luxury hotel map over 30 years ago, is that you could very well be in France. The manicured grounds look like a Cezanne painting; the terraced Michelin star restaurant, which tempts guests with caviar, foie gras, and veal sweetbreads, sits above a vista of vineyards; and the private cottage-like rooms, complete with private terraces, brings to mind Provence. Not that you’re going to be pining for French wine in the heart of Napa Valley. Whether yearning for romance or me-time, this is a place where you can’t help but relax. Don’t miss: Lazy afternoons spent by the stunning pool. Set on 37,000 acres of rolling hills in Big Sky Country, this luxury retreat located on a working cattle ranch in Western Montana caters to (and spoils) your inner child. There’s ATVing, fly fishing, paintball, archery, rappelling, target shooting, snowmobiling, cross-country skiing, and bucket list items like hot-air balloon rides. 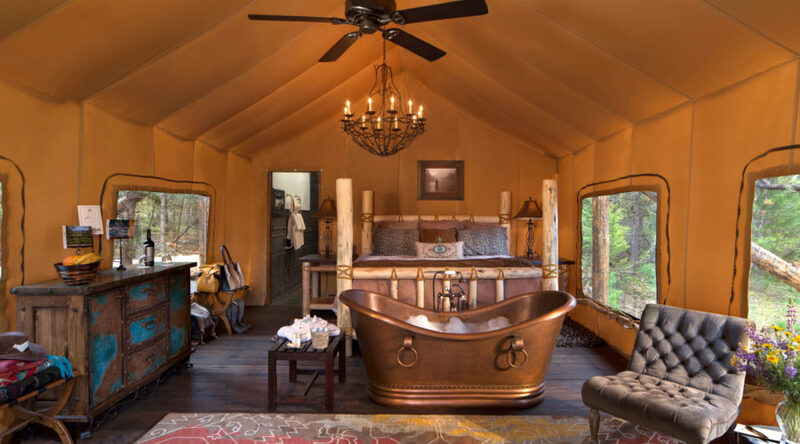 Accommodations include luxury log cabins in the pines and riverside glamping-style tents that come with your own personal camp chef and butler. Another huckleberry mojito, please! Don’t miss: The authentic cattle drive. Surrounded by dramatic buttes and majestic mesas, the 34-room architectural marvel set on 600 acres in the remote canyonlands of Utah appears to be built right into the landscape. Rooms come with more than a view. Designed to frame and enhance the stunning natural setting, the sumptuous sleeping quarters provide impossibly chic beds, tubs built for two, and open terraces with firepits, plus the larger suites boast lap pools and sky terraces. And then there’s the hotel pool, a tranquil oasis that wraps around an enormous sandstone rock. The surrounding desert will keep you busy by day with everything from rock climbing to horseback riding, while evenings bring dramatic sunsets and clear, starry skies. Ski stays don’t have to mean chilly cabins and antlers hanging on the walls. 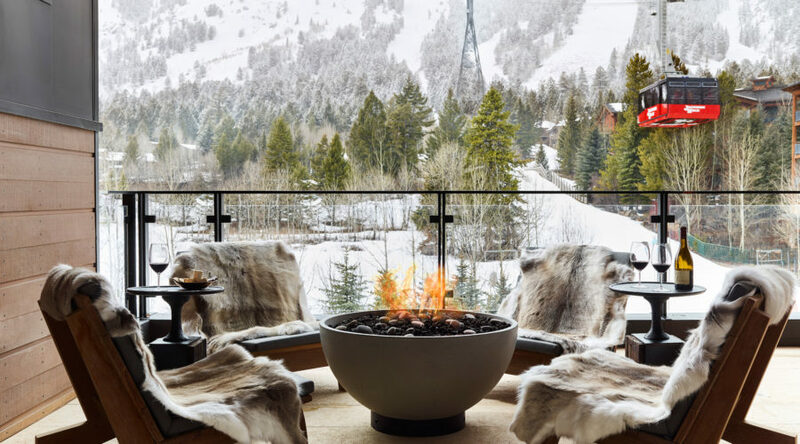 Enter Caldera House, a beyond-luxe property at the foot of Jackson’s slopes. Just eight suites strong, the luxury hotel offers 2- or 4-bedroom options, each with floor-to-ceiling windows, custom-built furnishings, handwoven textiles, and private balconies. Yes, this place oozes decadence. Same goes for the curated experiences available only to guests, from soul readings and standup paddleboarding in the Tetons to backcountry heli-skiing and horseback riding with bonafide cowboys—all exclusive and unforgettable. Don’t miss: Ordering room service from the beloved Italian restaurant Old Yellowstone Garage—even better yet, arranging for chef Paulie O’Connor to prepare a meal in-suite. The Kahala is no stranger to celebs. Bill Clinton, Jay-Z, The Rolling Stones, Elton John, Rihanna, and even Princess Diana have stayed here. 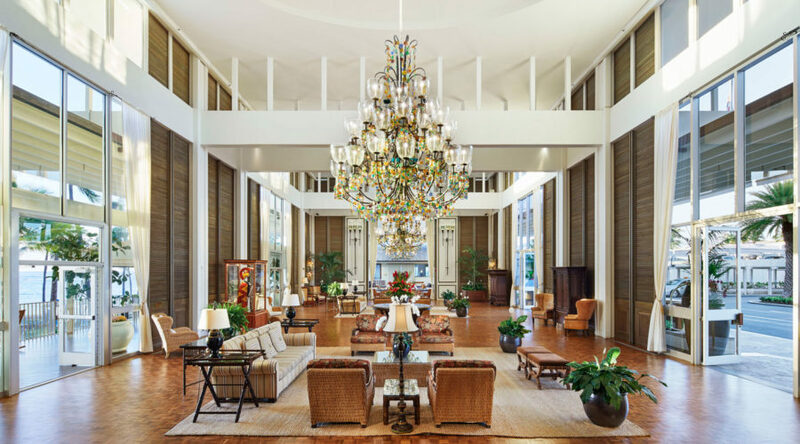 From the chandelier-clad lobby to the palatial Presidential Suite which takes up an entire wing on the ninth floor, the 338-room resort is pure opulence. Set on a secluded white-sand beach slightly removed from Waikiki, your wish is the staff’s pleasure to fulfill, from arranging a private butler to chartering a private yacht. Don’t miss: Dining on charred spiced octopus and crispy moi at Hoku’s, Kahala’s recently renovated restaurant. There is a castle on a cloud—actually, more like a dreamy mountain—and it’s Fairmont Banff Springs. 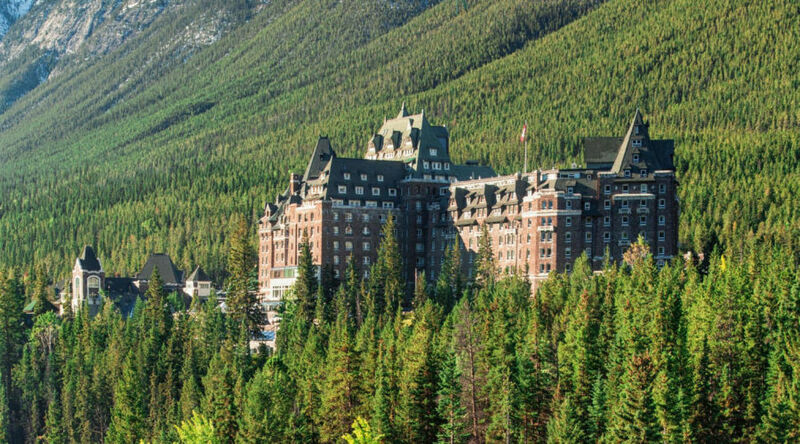 80 miles from Calgary in the heart of stunning Banff National Park, the 757-room palatial property, with its signature stone walls, turrets, chandeliers, and winding staircases, sits at 4,500 feet above sea level and dominates the skyline. Here, everything is elevated, from the food offerings (the hotel houses 11 restaurants and bars) to the spa (complete with waterfalls and mineral pool) to the panoramic 27-hole golf course. As glorious in summer as in winter, the property offers access to the great outdoors year-round; the concierge can arrange everything from dog sledding to guided hikes. Don’t miss: Soaking in Banff Upper Hot Springs. 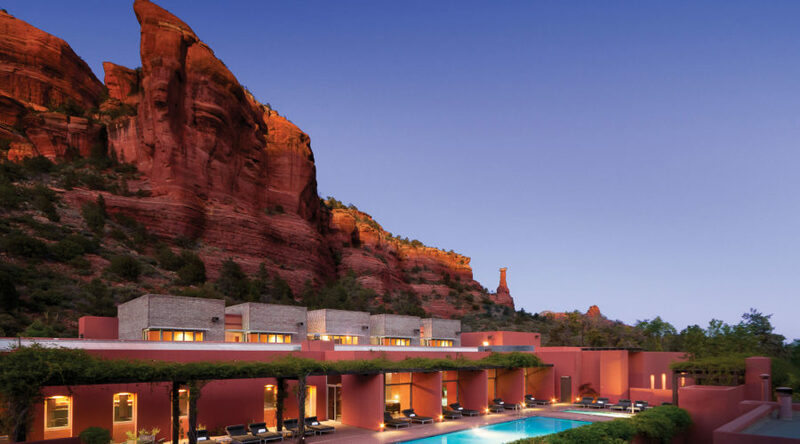 Ahhh, Mii amo...set on the grounds of Enchantment, a 70-acre resort famed for its stunning red rock surroundings and energy vortex vibes, this place is utter bliss. Whether you book a three-, four-, or seven-night all-inclusive stay, you can’t help but having the spa experience of a lifetime. With only 16 adobe casitas (the Luxury Suite is the most luxe with outdoor shower, fireplace, and whirlpool) and an unsurpassed spa menu of Native American-inspired and spiritual therapies—think astrology readings, chakra meditation, and massages based on the stages of the moon—you’re in store for an utterly bespoke wellness journey. And yes, they have wine, too! Don’t miss: A sunset drink on Che Ah Chi’s patio. 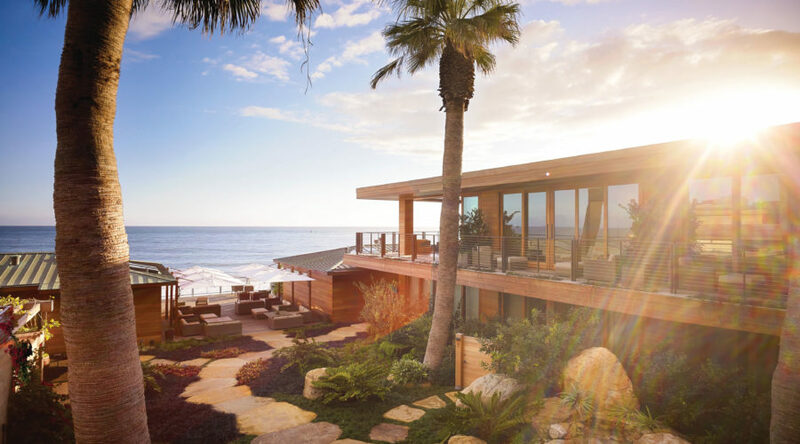 Combine far-flung Japan with Malibu’s exclusive Carbon Beach and you have Nobu Ryokan, a 16-room minimalist masterpiece next door to Nobu restaurant. Each of the unique rooms pays homage to traditional Japanese design, with sparse furnishings, tatami mats, and teak soaking tubs. As well as the ocean right out your door, there’s a 37-foot lap pool, relaxation deck, and courtyard garden, all zen-like. Room service comes courtesy of Nobu’s kitchen; you also get first dibs on reservations when dining at the restaurant. Not that a room reservation is easy to secure—to book a stay here, guests must first inquire through the web site. Don’t miss: The linen Yukata bathroom robes.